Bratton, the lawyer who was taken down when Frank Gallo revealed everything that happened to the inmates wants to come after Zane. He wants to bring up the fact that Harvey and Mike gave Zane information illegally and make it seem as though the money Frank had Mike give his daughter denise was money I'm exchange for Frank's testimony. Denise says that if she is put on a stand, she wouldn't have anything positive to say about Frank and could cost them. Robert and the others scramble to figure out how to defeat Tommy. 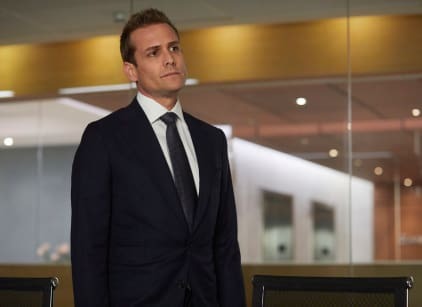 They try to figure out why Tommy would threaten to take them down if he would get in trouble and face jail time in the process. .
Robert thinks he is bluffing but quickly finds out that's not the case They try to arrange for a deal with Gould, Tommy's former firm partner. Louis uses a recording he received from Alex to get Gould to flip on Tommy. Gould.comes with a deal, but Harvey refuses to admit their wrongdoing because it would risk their licenses. Louis finds out that Tommy is dying and that's why he's going so hard and after them before he dies. Harvey tries to reason with Tommy using that information but Tommy doubles down. So much so that he has a heart attack and dies. Zane and the firm are in the clear. Samantha and Alex have another conflict between their clients. They are told to mediate to avoid trial. Instead,.they use it as competition again. Samantha tries to call in her favor from Louis. She wants him to shut Alex down. He refuses. Harvey eventually suggests that they have a big case they take on and whoever wins will get named partner. Katrina takes her first case as senior partner. She makes Brian her associate. Thr case is a tricky copywrite case involving a friend. Brian takes Katrina out to celebrate. They bond and find out more senior about each other. When they hit a bump in the case, Katrina takes it out on brian. He calls her out on her poor plans. Katrina gets advice from Harvey. Brian figures out a solution. Katrina struggles with her growing attraction to Brian. Louis gives her a pep-talk.